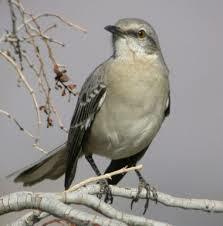 The mockingbird is Florida’s state bird. Loved by many for its beautiful and pleasant song and can often be heard singing all night long. Mockingbirds are usually about ten inches in length, with a fifteen-inch wingspan, grayish upper portions, white undersides, and white patches on the tail and wings. The female has slightly less whiteness in its feathers than the male. Mockingbirds are fierce defender of the family nest, and you will see them often scooping down and flying around cats or other threats.